According to a report by The Nation, Prince Ukpong Akpabio has recounted how his people in Essien Udim Local Government Area of Akwa Ibom State were terrorised by Senator Godswill Akpabio during the March 9 elections. Prince Ukpong Akpabio, who is Senator Akpabio’s cousin, said they saw hell in the hands of Senator Akpabio and his supporters. A communiqué signed by the stakeholders and leaders, and read by Imo-owo Okpokpo, reads: “Essien Udim people condemn the electoral offenses and irregularities masterminded and perpetrated by Senator Godswill Akpabio and his cohorts, in which almost all the election process in the area was marred by unlawful militarisation, rigging and assault on officials of the Independent National Electoral Commission (INEC). “The atrocities include carting away of electoral materials and kidnapping of INEC ad hoc workers, with military help, to the home of Ibanga Akpabio. They maintained that in units where elections held, PDP won and they have their result sheets intact. According to them, any other result is fake and does not represent the people’s votes. The people rejected the published results so far released by INEC, and condemned the cancellation of results in nine wards in the council area. They admonished Senator Akpabio to desist from further advertising “his declining and dwindling political status through interviews as such will continue to deepen his failing image. “We have totally rejected by him as a people,” they said. But Senator Akpabio described them as political merchants and contractors hired to tarnish his image. 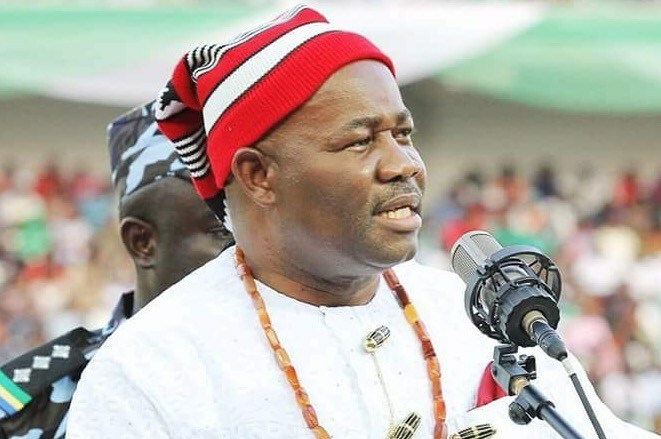 Akpabio, who spoke through his media aide, Anietie Ekong, said: “”The people are hired political merchants and contractors who have been procured to denigrate Senator Godswill Akpabio to diminish him for a token. But it is a futile attempt. “The allegations are spurious, baseless and unfounded. They can gloat over the pyrrhic victory recorded by the PDP, but Akwa Ibom people know that never in the history of the state have we witnessed such heist and electoral robbery aided by a compromised umpire like in the last election.